"This is a new line of soul food, a variety on a plate as traditional as corn and peas in butter, with spinich and string beans on the side. Her tunes are like dinner menues." She is currently working on an EP of new songs working under the title, "Is this What We’re Living For?” with producer Mitch Girio, guitarist Steve Briggs and members of Isabel and the Uncommons. These are song about the times and challenges we are living in. In 2014 Isabel released her own solo debut album of original songs, country and folk inspired called, Hearts and Arrows supported by an ace band, Isabel & The Uncommons produced by Don Kerr. Isabel won the singer songwriter award for her live performance of her song, “ Something Sacred,” at the New Market Arts Council (Nov. 2015). Another track, "New Moon" was chosen to be part of a city initiative, Toronto 311, which brings local artists’ music to the 311 system. Recently New Moon has been acquired by Crucial Music, a film and television publishing library. 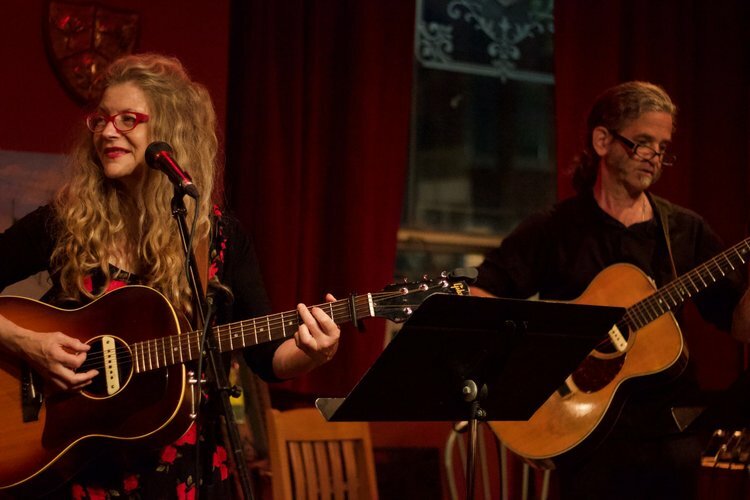 She has received radio play by CBC, Folk Routes Radio and other national and international community and internet radio stations. In 2015 she collaborated with the members Creative Works Studio to create the album Coming Out of Darknes , also produced by Don Kerr. Isabel founded Creative Works Studio in Toronto to help people with mental health and addiction issues find creative self expression through music and visual arts. Fryszberg composed the music and facilitated group lyric writing to express and give voice to the members in this community who have never sung or written music before. In 2016 the Album, “Coming Out of Darkness,” by the Social Mystic (the name of this band) was released. — Social Mystic participant John R.
Isabel was the founding member together with Lenka Lichtenberg, and one of the lead singers of award winning klezmer-swing sextet, Sisters of Sheynville, (2004-2011). Her parents were both Polish-Jewish immigrants and Yiddish was Fryszberg's first languge. The band was a way to keep Yiddish alive after her mother died. The band toured and played festivals in Poland, San Francisco, Washington, Vancouver, to Montreal and acquired the Canadian Folk Music Award (2008) for Vocal Group of The Year for their album, Sheynville Express.